This movie is about a girl, Sophie but when the evil Witch of the Waste turns her to a 90 year old lady, she find’s Howl and his castle. She must break her spell and survive her adventure with her friends, Markl, Keen, Turnip Head, and Howl and perhaps of the Witch of the Waste! My favorite character is Howl because he is magical. I also like when he can turn into a bird and he has a funny line. He says, “I see no point in living if I can’t be beautiful”. I think this is funny because it is ridiculous to be upset about your hair color. 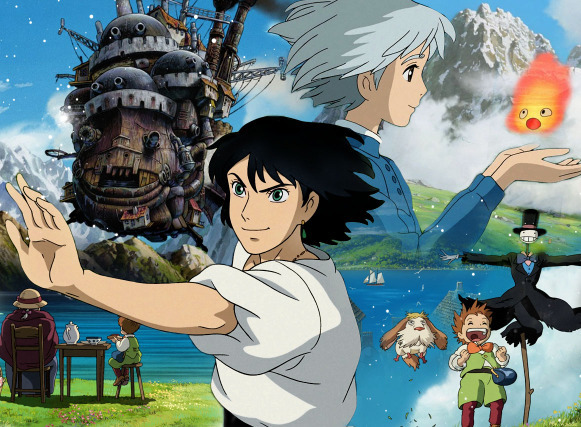 My favorite part is when Howl saves Sophie from the battleships because it is fantastic, stupendous music and terrific, phenomenal action. My rating is PG for intense battle/violent scenes, frightening images, mild language and romance. One the best movies ever and on my Top 5 list of favorite films! i like this review an d i am happy that you enjoyed the movie. I hadn’t heard of Howl’s Moving Castle before. I’m definitely going to check it out sometime based on your recommendation. I watched a bit of it online just now. Looks good. There are some comments about the subtitled version being better than the voiceovers. Have you seen it? I’d be interested to hear what you think. I have not seen the subtitled version of it but it is by a japan director so it is probablay in japanese. Ethan does not like it at all!!!!!!!!!! I like the engilish versoin alot though!!!!!!! I loved this movie. Thanks for sharing this with me Dylan. One of my favorite parts is when Howl makes a place for Sophie in the castle – all the things that she would like. This showed he had a heart. I loved the castle itself. It reminded me of something from Dr. Seuss.